Dragon Age: Inquisition was one of our favorite things at E3 . 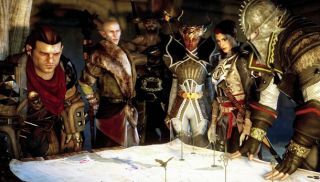 After checking out EA's lengthy gameplay demo on the floor, I inquired with Dragon Age's Creative Director, Mike Laidlaw, about how party members will influence story decisions, how Inquisition plays on PC, and a few other things I was curious about. Dragon Age will have 40 "major" endings , EA says. We're looking forward to diving in this October.